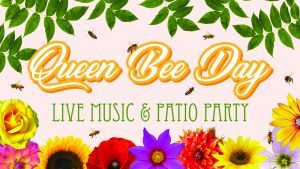 The 2nd Annual Queen Bee Day / Patio Party will be bigger and better than last year! It falls on Arbor Day and proceeds from this event will go towards The Sioux Falls ReLeaf Project – an organization dedicated to replacing the local ash trees affected by a small pest known as the Emerald Ash Borer. Special limited edition tees are available for purchase to support the ReLeaf Project – stay tuned for this exciting release! • Members of the ReLeaf Project will be present, speaking about how you can help while accepting donations to help fund the project. • Oakridge Nursery & Landscaping will be here educating and selling pollinator-friendly plants! • Dakota Honey Company (the honey we use in Queen Bee) will be there selling honey! • Speaking of Queen Bee, there will be limited edition, one time only, variants of Queen Bee pouring at the patio bar! • And to top it all off, 6 Feet Over will be donating their talents from 6-8pm and playing some fun tunes while you enjoy Queen Bee Day! This is an event you won’t want to miss; let’s kick the dust off from the long winter, and celebrate local causes, local plants, local music, local honey, and local brews!